The flower color is soft purple and the flowering period is from about July to August. The leaves are green and about 25 cm. high. The adult height of this plant is about 60 cm. This plant is suitable for gardens with several (almost) mature trees and shrubs. Requires a site with full shade from trees or shrubs and a soil rich in humus. This plant can also be used as a border plant (in a slightly sunnier spot). The soil should be moist or well. Hardly proliferates and combines well with other plants. The flower color is violet and the flowering period is from about July to August. The leaves are gray-green and about 40 cm. high. The adult height of this plant is 100 cm. This plant is suitable for gardens with several (almost) mature trees and shrubs. Requires a site with full shade from trees or shrubs and a soil rich in humus. 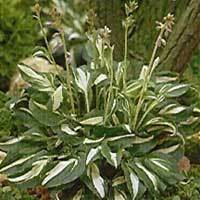 This plant can also be used as a border plant (in a slightly sunnier spot). The soil should be moist or well. It is a striking plant. The flower color is lilac and the flowering period is from about July to August. The leaves are green and about 40 cm. high. The adult height of this plant is about 60 cm. This plant is suitable for gardens with several (almost) mature trees and shrubs. Requires a site with full shade from trees or shrubs and a soil rich in humus. 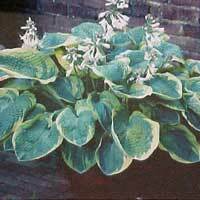 This plant can also be used as a border plant (in a slightly sunnier spot). The soil should be moist or well. It is a striking plant. The flower color is white + purple and the flowering period is from about July to August. The leaves are steel blue and about 40 cm. high. The adult height of this plant is about 60 cm. This plant is suitable for gardens with several (almost) mature trees and shrubs. 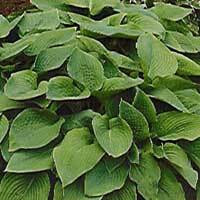 Requires a site with full shade from trees or shrubs and a soil rich in humus. This plant can also be used as a border plant (in a slightly sunnier spot). The soil should be moist or well. It is a striking plant. The flower color is blue and lilac flowering time is from about June to August. The leaves are yellow variegated and about 40 cm. high. The adult height of this plant is about 60 cm. This plant is suitable for gardens with several (almost) mature trees and shrubs. Requires a site with full shade from trees or shrubs and a soil rich in humus. 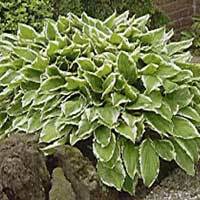 This plant can also be used as a border plant (in a slightly sunnier spot). The soil should be moist or well. It is a striking plant. Hosta 'Golden Meadows' has long been a favorite.Hosta 'Golden Meadows' is a stunning sport of Hosta sieboldiana 'Elegans' This is one of the most instantly recognizable hosta cultivars in our garden. More morning sun helps to keep the leaf color bright. The flower color is blue and white flowering time is from about June to August. The leaves are yellow variegated and about 40 cm. high. The adult height of this plant is about 60 cm. This plant is suitable for gardens with several (almost) mature trees and shrubs. Requires a site with full shade from trees or shrubs and a soil rich in humus. This plant can also be used as a border plant (in a slightly sunnier spot). The soil should be moist or well. It is a striking plant. The flower color is blue and soft lilac flowering period is from about July to August. The leaves are gray-blue and about 20 cm. high. The adult height of this plant is about 50 cm. This plant is suitable for gardens with several (almost) mature trees and shrubs. Requires a site with full shade from trees or shrubs and a soil rich in humus. 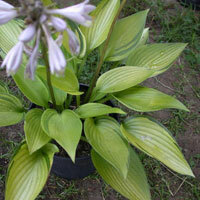 This plant can also be used as a border plant (in a slightly sunnier spot). The soil should be moist or well. 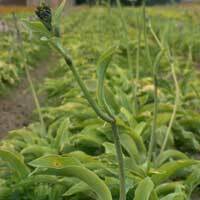 Hardly proliferates and combines well with other plants. This one, ‘June’ has strikingly variegated leaves. They are cupped, thick, corrugated, heart-shaped, tapering to a point, and chartreuse with broad, streaky margins of blue-green and pale green. In late summer, lilac bell-to-funnel-shaped flowers appear on leafy stems held above the leaves, which grow in a spreading mound. Cream-Yellow leaves with dark green margins. 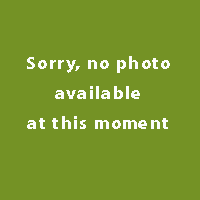 Produces lilac flowers from Jun-Aug. Ht. 60cm. First grade loose root plants supplied. 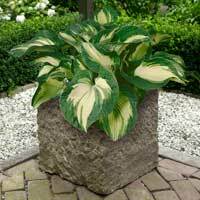 Great at the front of the border, in containers or as ground cover under deciduous trees. 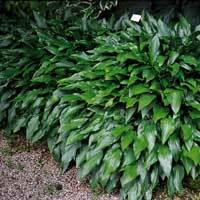 One of the bolder blue specimen hostas, ‘Love Pat’ boasts thick, heart-shaped, ice-blue foliage that is heavily quilted and deeply cupped. The leaves often fade to green late in the season, usually after flowering. 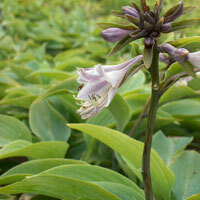 In the summer months plants produce tall stems topped with pale lavender to white, trumpet-shaped flowers. Once flowering is complete, cut back the dying stems to let the foliage do all the talking. The flower color is violet whit white.border and the flowering period is from about July to August. The leaves are white variegated and about 30 cm. high. The adult height of this plant is 100 cm. This plant is suitable for gardens with several (almost) mature trees and shrubs. Requires a site with full shade from trees or shrubs and a soil rich in humus. 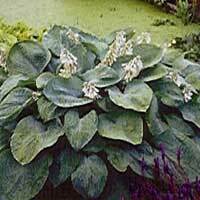 This plant can also be used as a border plant (in a slightly sunnier spot). The soil should be moist or well. It is a striking plant. The flower color is lilac and the flowering period is from about July to August. The leaves are white variegated and about 25 cm. high. The adult height of this plant is about 60 cm. This plant is suitable for gardens with several (almost) mature trees and shrubs. Requires a site with full shade from trees or shrubs and a soil rich in humus. This plant can also be used as a border plant (in a slightly sunnier spot). The soil should be moist or well. Hardly proliferates and combines well with other plants.